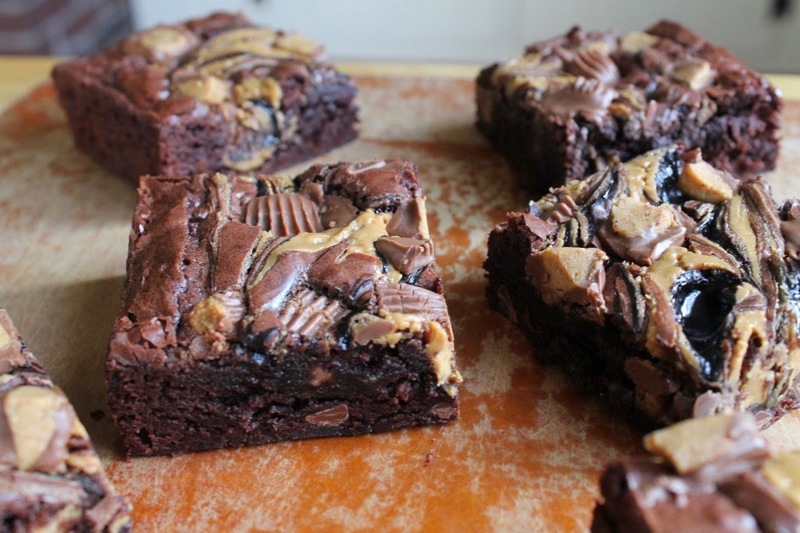 Decadent brownies with peanut butter swirled in and topped with Reese's Peanut Butter Cups. Peanut butter and chocolate is really a match made in heaven. They were made for each other. Growing up I wasn't able to enjoy this match up very often due to the fact that my mom is allergic to peanuts. It was just too dangerous to have messy kids around peanut butter. I am clearly making up for time though now that I don't have to worry quite so much. We have all sorts of nuts in the house, about 10 different jars of peanut butter and always a jar full of Reese's Peanut Butter cups. 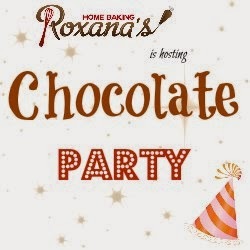 There were several ideas running through my head about what I should make this month for Roxana's Chocolate Party when she announced the chocolate pairing of peanut butter. I have made cookies and pie with chocolate and peanut butter in the past. For this recipe I wanted something new and a bit over the top. Having peanut butter swirl brownies seems to get me closer to what I wanted to create but adding peanut butter cups was what really sealed the deal. These brownies are over the top and I loved every bite of them. I have also realized that sweet treats make for an amazing thank you. We filled a big hole in our yard this weekend with free fill from down the road. To show our appreciation we gave him the last two brownies. Boy was he a happy fellow. Heat oven to 325°F. Grease 8x8-inch baking pan. Melt butter in medium saucepan over low heat. Add 2 cups sugar and cocoa; stir to blend. Remove from heat and cool slightly. Stir together flour, salt and baking soda; stir into chocolate mixture. Stir in 2/3 cup mini peanut butter cups; spread mixture in prepared pan. In a microwave safe bowl combine peanut butter and remaining 2 tablespoons sugar. Place in microwave and cook for about 30 seconds until softened and just starting to liquify. Drop by tablespoons onto chocolate batter. Swirl with metal spatula or knife for marbled effect. Sprinkle top of brownies with 1/2 of the cut up Peanut Butter cups. Bake 40-45 minutes or until brownie starts to pull from edges of pan and is set. Remove from oven and sprinkle the remaining 1/2 of the Peanut Butter cups on top. Press gently into the brownies. The heat from the brownies will melt some of the chocolate to help blend into the brownies. Cool completely in pan on wire rack. Cut into squares. Makes 9 large brownies. There isn't much better than fudgy brownies loaded with chocolate and peanut butter! Oh, yeah!!! These would hit the spot when I need a chocolate fix!!! Excellent! A perfect treat and a must try! GIRRRRRRRRL! These brownies look cuhhhhrazy amazing-all the pb cup goodness! Um, these look like pure heaven!! These look so good! I made brownies too but the inclusion of the reece cups makes yours the winner for sure. I will have to add these to my recipe too I think! !